Did his recently-shaky reputation a world of good with a fine show and goal v Azerbaijan last night. We might have been ridiculed for suggesting a Croatian international at age 26 with a goal and growing international reputation could be in the £20M bracket (like pretty much all his international team mates), but anyone who thinks such a player is still only £2M is a continuation of the new ‘put down’ ‘supporter’ breed that’s beginning to depress us. The same ones now telling us Ryan Jack is average. For his part, Barisic had a fine night, and hopefully kicks on regarding his Rangers performances. Another good night, if only a cameo, Morelos was highlighted for his nutmeg and the possibility he did his future selection possibilities the world of good. A brief but productive appearance for his second cap. Nailing a penalty for his country, Davis had a good night too. 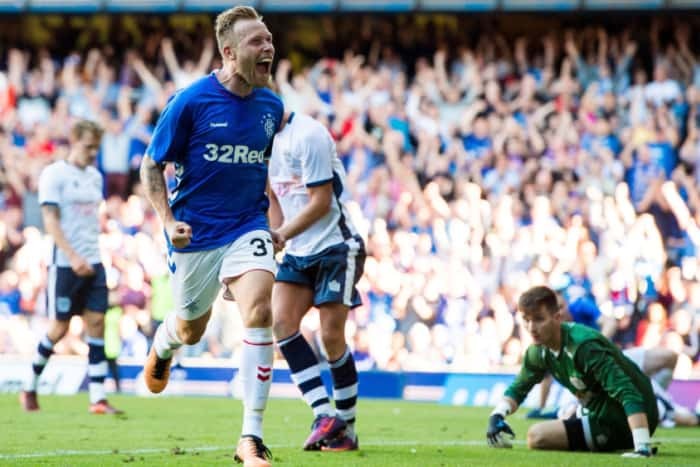 The NI man hasn’t had the brightest return to Rangers, but did have a better match in the otherwise all-round travesty that was the Killie result, and took that form to his nation. He’ll be pleased with his contribution. Managed an assist for McGinn’s opener in the same match and started this one. Another productive night for a Rangers player, Lafferty will want this form at Ibrox. Away with Mali, he may play tomorrow v South Sudan in the CAN – hopefully the on-loan Angers man can have a good match and get some form back. It’s derailed quite badly for him at Ibrox. Another cap for the Albanian international, Grezda has only just returned to fitness but did start v Wales last night. A decent night for him too but he could only last 68 minutes. Not surprising. The boy needs games. Called to play v French Guiana on Sunday, we’re not clear if the ex-Burnley man made the trip as he’s not expected by some outlets to start this one. But if he is, it’s yet another cap for one of Rangers’ best players and we wish him the best. It’s so nice to once again be talking about the number of internationals in our side – in years gone by if we had even one, we were happy. Now half the team is.